Gold dropped at the bullion market today on profit-taking from stockists and investors,coupled with reduced local buying interest at the existing higher levels,also driven by a fall in the international markets. Silver succumbed to hit nearly two month lows and retraced Rs 47K-per kg market owing to hectic speculative sell-off. Standard gold of 99.5 per cent purity fell by Rs 130 to end at Rs 30,265 per 10 gram,from Monday’s closing level of Rs 30,395. Pure gold of 99.9 per cent purity added Rs 115 to finish at Rs 30,415 per 10 gram from Rs 30,530. 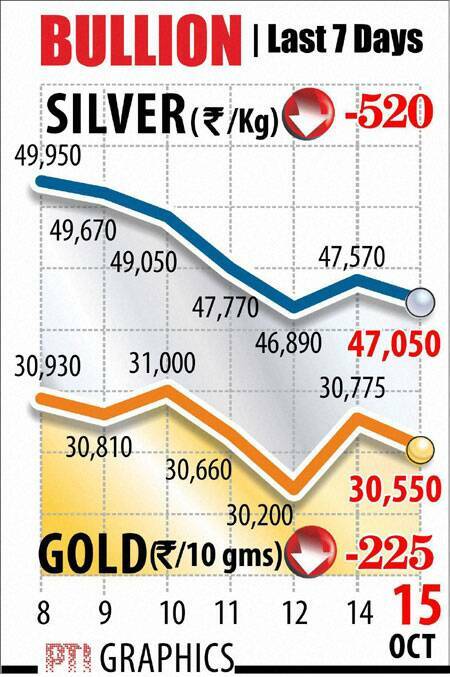 Silver ready (.999 fineness) slumped by a hefty Rs 1,435 to end at Rs 47,225 per kg from Rs 48,660 previously. Overseas,gold dipped to its lowest in three-months on hopes that policymakers are close to settling the US debt negotiations in Washington waning interest in the yellow metal as safe haven appeal. In London,gold bid lower at USD 1,256.96 an ounce in early trade and silver bid down at USD 20.74 an ounce.